I'm not a very big fan of Paranormal/Fantasy books, however the only exception for me is books that contain magic. I am a sucker for those! When I found out that Cate Tiernan, the author of The Sweep series has a new series that is about magic, I got excited and at the same time mentally slapped myself for not knowing about it sooner! You all know how much I LOVE The Sweep series. I even went out and got the new bind ups of them. The Sweep series is also about magic and it is OH SO MAGICAL! 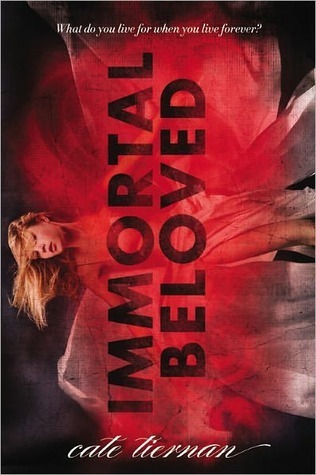 I loved every bit of it, which is why I had such high expectations for Immortal Beloved. The story starts off with Nastasya, call her Nasty for short, an immortal with witchy powers. She spent the last 400 years or so partying hard and avoiding performing magic like the plague. One day she sees one of her supposed friends, Incy, performing magic to hurt a 'human' and she freaks! She flees to the U.S, remembering a woman she met 90 years ago that told her she can come to her home, which is like a rehab for immortals, if she ever wanted MORE from her life. When she arrives, she gets welcomed, rather coldly, by Reyn, a gorgeous yet somewhat unfriendly immortal that she can't seem to shake off how familiar he looks. She then has to start to learn how to appreciate life, learn about magic, herself, and most importantly, her family history that seems to be the key to all her and the reader's questions. It took me a while to like Nasty, at the beginning she was whiny, a diva, and basically wanted to give up anything that required a tiny bit of effort on her part. Even when she made the decision of moving to 'rehab', she kept on complaining about everything and acting like a 5 year old. However her character DOES grow, and I always prefer it when there is character growth in books as opposed to the character being the same from the first to last page. Other characters I found interesting were Incy, Ryen, Dray - the goth girl Nasty becomes friends with, and Meriwether - the store owner's daughter, which is where Nasty works. You can see that most of these characters are secondary, but at the same time Cate puts life into them and you just can't help but feel curious about THEIR stories and background history. I know Cate Tiernan's style of writing, she usually takes her time laying down the foundation of the book, taking her time familiarizing the readers with the characters, and basically giving her characters authenticity and depth. This is why Immortal Beloved might have seemed long in the page count but at the same time nothing much happens throughout it. However towards the end, you get an overload of shocking information, discoveries, and unveiled secrets and decisions that remove any thoughts of not continuing this series, because that ending? WOWZER! I honestly can not wait to read Darkness Falls because I know it will be packed with action and magic!